Today Esther and I took Markus to Seattle Pacific University to begin his college adventure. It was an emotional day with a lot of apprehension about what the future holds. We got to meet his roomate and parents who are also from Port Orchard. 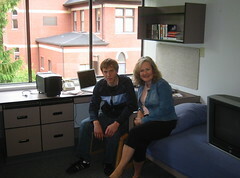 His roomate is a junior and can help Markus with all the initial details of life at SPU. One of Bjorn's friends, Boone, who works in financial services helped us clear up some paperwork. After getting Markus settled and going to the invocation ceremony and courtyard barbecue, we left him to tackle the orientation weekend by himself. While it is rewarding to see Markus step out into adulthood, it is sad to say goodbye to his childhood and feel the vacancy of his absence.